Painting secretary bird tutorial. In this tutorial, I will show you how to paint a secretary bird from a video tutorial and step by step images. This style of painting is more like a translucent or see thru paint over a detail drawing or ink. It is very similar to using water color to glaze over the tight drawing. Though in the final stage, I use opaque or solid color to bring out form and manipulate the lighting on the subject. It is a lot easier to do this technique in Photoshop because you can adjust opacity or you paint and using overlay to get the transparent effect. This tutorial is the second part of how to draw secretary bird tutorial I previously posted. This tutorial is more of a quick color study or sketch rather than a finished work I usually do. This sketch is done with Photoshop CS5 and a Wacom tablet. The Secretarybird or Secretary Bird is a large, mostly terrestrial bird of prey. Endemic to Africa, it is usually found in the open grasslands and savannah of the sub-Sahara. Here is a final painting of a secretary bird. 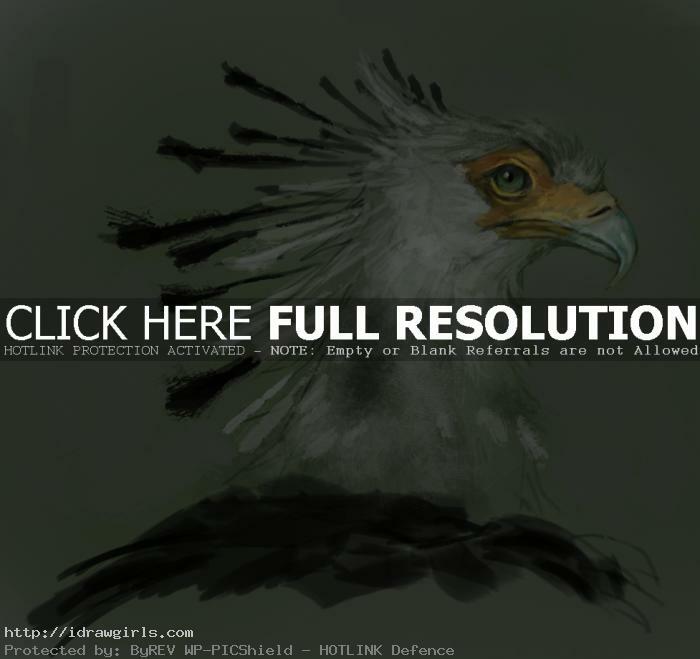 Below is a video tutorial how to draw and paint secretary bird. Here are step by step how to paint Secretary bird. Step one, I bring the final drawing in. Step two, set up soft desaturate background color. Step three, I add some white paint. Step four, I paint yellow on its facial pattern and teal on its beaks. Step five, I clean up color and emphasis more on lighting.